Life has been such a wonderful journey and thanks to all of my friends and family, it truly has been a blessing! Without you all, I would not be who I am today. I also want to give praise to my wonderful boyfriend, Dominic, who has surprised me with the cruise! Thanks for visiting my trip website and my registry!!! Together, we will experience an underwater world of beauty on our tropical escape! 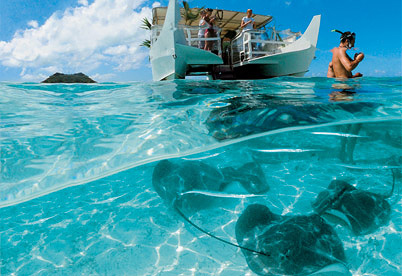 A boat will take us to the edge of a barrier reef where we will receive safety and diving instructions. Next, we will enter the water and drift with the current inside the Tiputa Channel, where the Pacific Ocean meets the lagoon, where we will explore an array of colorful corals and come across exotic fish, sharks, dolphins or rays! With your lovely gift, we will learn about the history and cultivation of black pearls at Rangiroa’s Black Pearl Farm! Once we arrive at the pearl farm, the staff will teach us about the farming and production of black pearls before we make our way to the work sheds where oysters are sorted and cleaned. Afterwards, we will be able to view a selection of unset black pearl while our guide teaches us about grading pearls in terms of quality. We will even have the opportunity to purchase them! 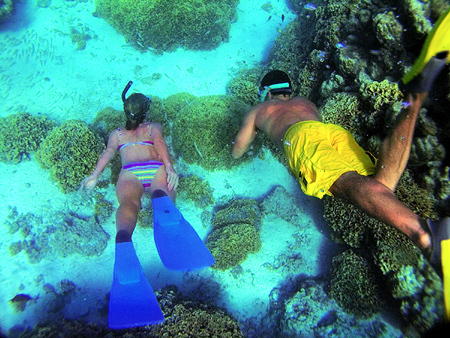 On our romantic escape, we will discover an underwater world of Rangiroa’s exotic beauty! Aboard a glass-bottomed boat, we will slowly float over colorful coral gardens inside the Tiputa Channel and witness tropical fish and other types of amazing marine life. We will view schools of parrot fish, butterfly fish, surgeon fish, black-tipped sharks and the majestic Napolean fish. This will be an excursion that we will never forget! The Porthole Stateroom offers us a charming haven to relax and unwind after a day of exploration in the South Pacific! Our room features a queen size bed with plush bedding, a bathroom and a shower with amenities, comfy bathrobes and slippers, a refrigerator stocked with soft drinks and more. Thanks to your contribution, we will pamper ourselves in the surroundings of our Porthole Stateroom!